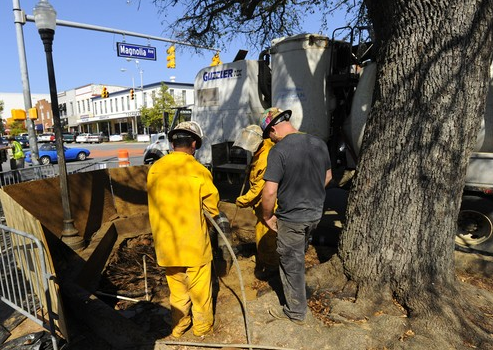 Workers remove soil from around the trees at Toomer's Corner last Friday. Due to the spring weather, the two poisoned oaks at Toomer’s Corner are beginning to show signs of decay, but the task force charged with saving the trees continues to hold out hope for their recovery. Over the weekend, workers were once again removing soil from the tree bed after tests revealed that Spike 80DF, the herbicide that Alabama fan Harvey Updyke Jr. claimed to have applied to the oaks the week after last year’s Iron Bowl, went deeper into the soil than originally thought. Despite live oaks typically dropping older leaves in the spring rather than the fall, both Keever and Enloe said that the trees’ current yellowish color and increased loss of foliage are likely the result of Spike 80DF. A lift will be used on Friday to examine new shoot growth at the top of the trees’ canopies. Enloe said the task force continues to consult with tree experts from around the country, most notably Dr. Kim Coder, a Professor of Tree Biology and Health Care at the University of Georgia. Coder, one of the world’s foremost experts in issues related to tree stress, assisted in the successful efforts to save the historic Treaty Oak in Austin, Texas, a live oak that in 1989 was vandalized with an application of the hardwood herbicide Velspar. Jimmy Cobb, a member of the Toomer’s Task Force who lives in Auburn, and a regional sales rep for Dow Chemical, the company that manufactures Spike 80DF, asked for Coder’s help in late February at the North American Tree Conference in Savannah, Ga; Coder, who has also served as President of the International Society of Arboriculture, delivered the conference’s keynote address on the biological history of live oaks. Due to scheduling conflicts, Coder said he likely won’t be able to make it to Auburn to examine the latest data on the oaks until mid-April, but actually deems the steps taken to preserve the trees before the poisoning to be their best chance for survival. “There’s always hope,” Coder said. Photo via The Opelika-Auburn News. The trees are not dead, they are just down 24 -0. WDE!